Put the following style sheet to <head> tag. Add the following scripts to <head> tag. setTimeout("setBG('" + gridId + "')", 1000); //1000 is equal to one second and call function every one second. 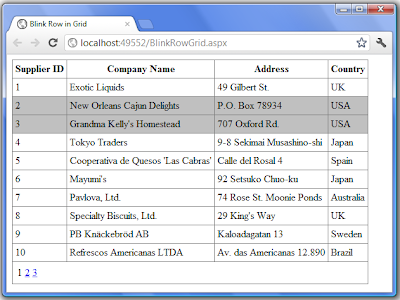 Create a Gridview as below. 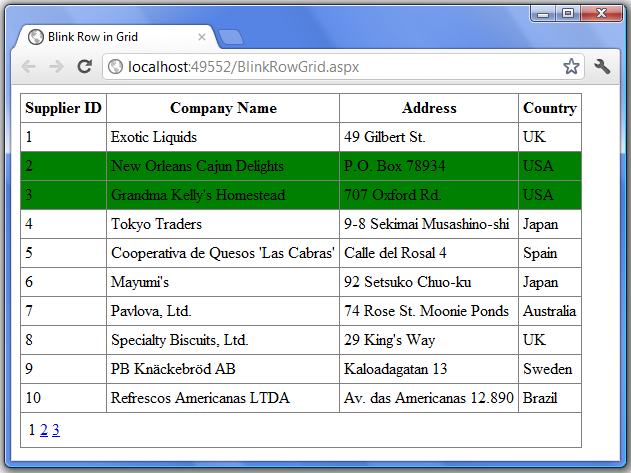 I used "Northwind" db and "Suppliers" table. AllowPaging="True" AlternatingRowStyle-Wrap="True" EmptyDataText="There is no data." Add the below code snippet to code-behind. //Data binding here. I used EF. if(country == "USA")  //set the row background color on condition here. That's all what you have to do. You'll be glad you did. Every row has blinking, when they have "Country" column is "USA". RSS is an XML format used for syndicating news and similar content from online news sources. It stands for "Really Simple Syndication" and consists of a channel that represents the news source, which has a title, link, and description that describe the news source minimally . Additionally, an RSS feed typically contains one or more item elements that represent individual news items, each of which should have a title, link, or description. 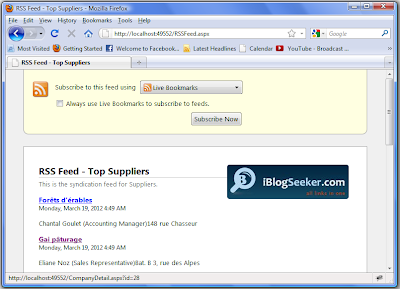 Having an RSS feed for your site has become a necessity in recent years. With blogs or news sites being updated frequently, RSS has allowed readers to keep up with new content without being forced to visit them. This tutorial show you how to create an RSS feed with ASP.NET, and how to render XML documents on ASP.NET Web pages. Create "RSSFeed.aspx" and remove default html markup and then put Repeater control and embed the RSS syntax as below. 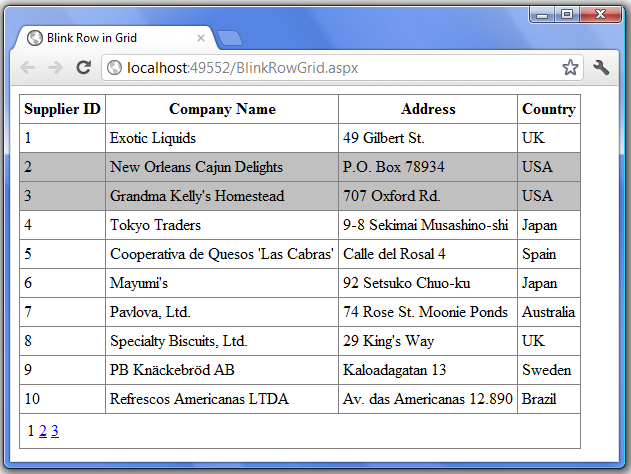 I used the "Northwind" database (download here) and "Suppliers" table, and created ADO.NET Entity Data Model "NorthwindEntities" for data access (see here how to create Entity Data Model from Database). After creating Entity Data Model, you will see "NorthwindEntities" connection look like below. <add name="NorthwindEntities" connectionString="metadata=res://*/NorthwindModel.csdl|res: //*/NorthwindModel.ssdl|res://*/NorthwindModel.msl;provider=System.Data.SqlClient;provider connection string=&quot;Data Source=.\SQLEXPRESS;Initial Catalog=Northwind;Integrated Security=True;MultipleActiveResultSets=True&quot;"
Add the following code to code-behind. That's it. Now, your RSS Feed is available to your reader. 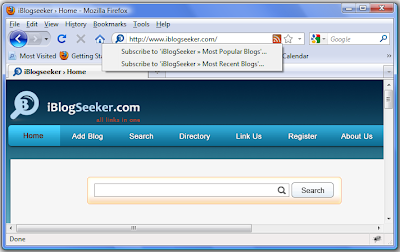 How to show RSS Feed from web site. If your site has RSS Feed available and you want to support this (the orange icon show up in the status bar) as below image, you can make it easy. For example, I used the following lines for my site. This feature support in IE and Firefox but don't support in Google Chrome (you need Extensions). Often, we have to use image verification for sign up in our application to prevent the automated registrations. This is essential because someone may send a lot of request programmatically to your server so that to slow down the speed of your server and making the size of your database large and large by entering much nuisance information. By creating the image verification on sign up page, it can reduces system loads and make better performance and security of your web site. This sample is about how you can verify user sign up while registering a user to your web site look like Yahoo and Google. 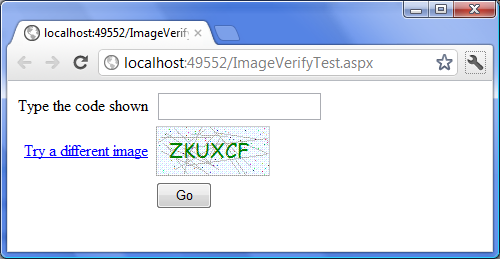 First we create ImageVerifyTest.aspx (such as Sign Up page) and put the following code to <form> tag. It use "UpdatePanel" for image so that don't refresh the whole page while clicking "Try a different image" button. <asp:Label ID="lblVerifyMsg" runat="server" Font-Bold="True" ForeColor="Red" Text="*"
<asp:LinkButton ID="lnkBtnImgVerify" runat="server" ForeColor="Blue" OnClick="lnkBtnImgVerify_Click"
<asp:Button ID="btnGo" runat="server" onclick="btnGo_Click" Text="Go"
And add the snippet code as below in code-behind. Second, create ImageVerify.aspx (for image) and put the code to code-behind as below. When I develop the web directory "iblogseeker.com", I need to check blog url user input. I found out the best way to detect whether a blog is alive or not, since blog url is very important and sensitive in this case. This example show detecting url on web using System.Net.HttpWebRequest and HttpWebRequest, and ValidatorCallout and RegularExpressionValidator for validating client side user input. ValidatorCallout is an ASP.NET AJAX extender that enhances the functionality of existing ASP.NET validators. To use this control, add an TextBox "txtUrl" and a validator control "RegularExpressionValidator1" as you normally do. Then add the ValidatorCallout "ValidatorCalloutExtender1" and set its TargetControlID property to reference the validator control. 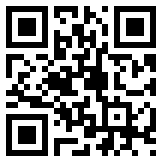 Add the following code to <form> tag. In code-behind, button click event look like as below. Whenever you type not-well-formatted url (including special character), it show message. if you put well-formatted url, it show HttpStatus of url.